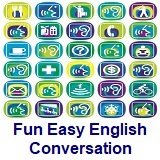 ﻿ Fun Easy English - new classroom free online classes english language lessons speaking listening writing reading april 1. 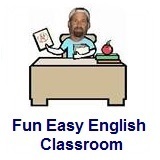 Today in the Fun Easy English classroom you are going to learn about April Fools Day. 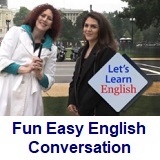 Today Americans play small tricks on friends and strangers alike on the first of April. One common trick on April Fool's Day, or All Fool's Day, is pointing down to a friend's shoe and saying, "Your shoelace is untied." 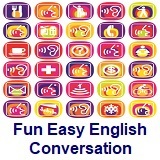 Teachers in the nineteenth century used to say to pupils, "Look! A flock of geese!" and point up. School children might tell a classmate that school has been canceled. Whatever the trick, if the innocent victim falls for the joke the prankster yells, "April Fool! " The "fools' errands" we play on people are practical jokes. Putting salt in the sugar bowl for the next person is not a nice trick to play on a stranger. College students set their clocks an hour behind, so their roommates show up to the wrong class - or not at all. Some practical jokes are kept up the whole day before the victim realizes what day it is. Most April Fool jokes are in good fun and not meant to harm anyone. The most clever April Fool's joke is the one where everyone laughs, especially the person upon whom the joke is played. "The first of April is the day we remember what we are the other 364 days of the year. " April Fool's Day was always a favorite holiday for me and my friends when we were kids. Playing jokes on each other was really fun. 1. In sixteenth-century France, the New Year was observed on which date? 2. Pope Gregory introduced a new calendar in what year? 3. What does "Poisson d'Avril" mean? 4. Based on the reading, what is a common trick on April Fool's Day? 5. Based on the reading, what is the most clever April Fool's joke? Patty: How old are you? Susan: Nine... but I’ll be ten on May sixteenth. Patty: I’m older than you! I’ll be ten on May fourteenth. Susan: Are you going to have a birthday party? Patty: Maybe. I’ll have to ask my mother. A short form equivalent to I’m nine years old. Notice that the strongest stress in this word is on the second syllable. (The stress pattern, as well as the final /n/, differentiates sixTEEN from SIXty.) Some speakers insert the between the month and the numeral: May the sixteenth, May the fourteenth. 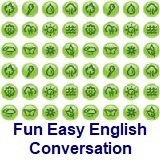 The contrastive stress on the first syllable of FOURteenth. Normally, the stronger stress falls on the second syllable of this word: fourTEENTH (like sixTEENTH in the line above). However, to bring out the contrast, the speaker emphasizes the contrasting element, four­. 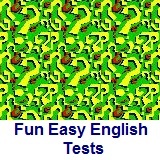 The rhythm pattern of English requires that this weak stressed, potentially three­syllable, element be reduced in length. In the process of reduction some of the consonants are lost or modified and the vowels changed to more centralized, lax forms. Notice that the normal stress for a compound noun falls on the first element of the compound. Notice that the intonation falls only slightly—indicating doubt, indecision, or lack of completion. Have to. See Lesson 7.